Mineral Spirits Poisoning is the accidental or intentional intake of products containing Mineral Spirits. What is Mineral Spirits Poisoning? What are the Causes of Mineral Spirits Poisoning? What are the Signs and Symptoms of Mineral Spirits Poisoning? How is First Aid administered for Mineral Spirits Poisoning? Who should administer First Aid for Mineral Spirits Poisoning? 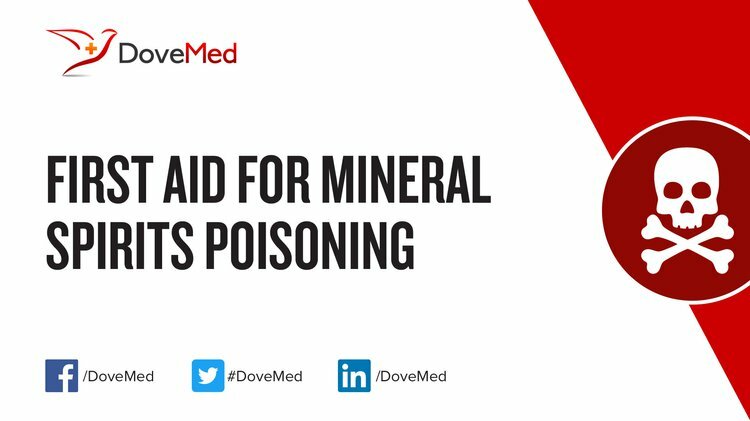 First aid for Mineral Spirits Poisoning is administered by healthcare professionals. What is the Prognosis of Mineral Spirits Poisoning? How can Mineral Spirits Poisoning be Prevented? Kopstein, M. (2011). Estimating airborne benzene exposures from air monitoring data for mineral spirits. Journal of occupational and environmental hygiene, 8(5), 300-309. Kreuzer, H. W., Wahl, J. H., Metoyer, C. N., Colburn, H. A., & Wahl, K. L. (2010). Detection of acetone processing of castor bean mash for forensic investigation of ricin preparation methods. Journal of forensic sciences, 55(4), 908-914. Inturi, S. N. R., Boningari, T., Suidan, M., & Smirniotis, P. G. (2014). Visible-light-induced photodegradation of gas phase acetonitrile using aerosol-made transition metal (V, Cr, Fe, Co, Mn, Mo, Ni, Cu, Y, Ce, and Zr) doped TiO 2. Applied Catalysis B: Environmental, 144, 333-342. Levine, M. D. (2013). Hydrocarbon Toxicity. WebMD LLC. Karydes, H. C., Zautcke, J. L., & Zell-Kanter, M. (2011). Chemical and traumatic occupational eye exposures in aviation personnel. Aviation, space, and environmental medicine, 82(11), 1064-1066. Vanhoucke, J., Buylaert, W., Colpaert, K., & De Paepe, P. (2017). Ingestion of white spirit resulting in perineal skin burns: a case report and review of the literature. Acta Clinica Belgica, 1-4. Pothiawala, S., & Ponampalam, R. (2014). Hydrocarbons. In HAZMAT MEDICAL LIFE SUPPORT: A Basic Provider Manual (pp. 54-58). Heise, C. W., & LoVecchio, F. Hydrocarbons and Volatile Substances. Czirják, L., & Varjú, C. (2011). A 35-Year-Old Man with Diffuse Scleroderma and Chemical Exposure. In Case Studies in Systemic Sclerosis (pp. 73-83). Springer London.